I'm determined not to make this blog into a pregnancy/ baby blog. Mostly because I know I have a decent amount of male readers (you know who you are!) and kidless adults who would probably boycott this little place, and I can't blame them. This blog is about our life, our animals and the happenings out here at TMF. While kids will become a part of it, the animals are the reason we're here, under this roof, on this land. But, both Matt and I have noticed a most interesting phenomenon since I've become pregnant that we find fascinating, lovely and incredible. I can easily say that some of our animals knew I was expecting before I did. 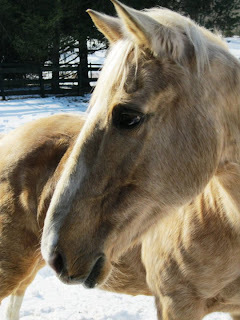 Topaz was the biggest indicator, being the matriarch of the family - she would snuffle at my stomach and blow on it, as if to say, "What's cooking in there?" She would also aim her nips and snaps of her teeth at places away from my stomach, or just in the air when I was grooming her or if her hay wasn't arriving in her stall quickly enough. Who needs a pregnancy test when you have Topaz? Monster the cat was next, and has remained the Baby Bump Guardian. The moment I'm seated somewhere - anywhere - Monster is in my lap, or if my lap is occupied, he's as close as he can get to my lap. He liked me before, but now, it's hard to enter a room without Monster hot on my heels. I'm curious to see how he'll react when the baby arrives - will he appoint himself Baby Guardian? This laptop gets in the way, but don't worry Mom, I'll get as close to you as I can. Zeus used to give me playful nudges in the stomach when I would groom or just fuss with him. On his own, he began nudging my arm instead of my stomach. He's also steady and quiet when under saddle, as if he knows he's carrying some cargo other than me. If that isn't a testament to an OTTB, I don't know what is! So far, he doesn't mind the fact that I'm not as svelte as I was a few weeks ago. I can easily say that the four-legged children have made this journey so much more fun with their intuition, careful treatment and wise eyes. This has been a very odd winter. Earlier this week, it was 60 degrees. Tonight, it will be 22 degrees. I'm not complaining - though I do wish it would snow on occasion, so the horses could roll in it and perhaps get the mud off their blankets and sheets, but all things being equal we've been relatively lucky this year. Still, it's always nice to count your blessings, right? Like all the fun things we've gotten to do this winter. I've actually gotten to ride far more than I did last year which is a biggie! I thought it would be fun to compile a list of the activities that have taken priority this year. 10. Having the ability to use the hose several days in a row and not having to lug water buckets from the house. 9. Using wagon that is at least 35 years old to lug aforementioned water buckets when it is too cold to use the hose. Yes, it is a Radio Flyer. 8. Take blankets off, put sheets on. 7. Take sheets off, put blankets on. 6. Take blankets off. Repeat steps 8-6. 5. De-mud horses (and blankets, and sheets) after numerous romps and rolls in the mud. 4. Serve Zeus warm water from special green bucket at night check (this one is Matt's fault). 3. Go inside and bake something, usually involving chocolate. Eat a majority of baked goods, because, well, it's here, and so am I. 2. Plan plan plan. I may not be able to event for the first half of the season, but that doesn't mean I'm slowing down on my competitive plans and goals! This means staying involved in Area I, reading as much as I can when I can't ride, and being as prepared as possible for post-baby, so I can be back in the saddle ASAP. Sooo, I guess that means I should put down the baked goods. 1. Watching these goofballs begin a daily afternoon ritual of face tag just makes my day.